Schools of yellowtail snapper roam reefs and wrecks from 16' out to 130' in large schools. After anchoring, yellowtail are brought up from the bottom with an obscene amount of chum. They can be targeted with light tackle by free lining small baits back into the chum slick. Chum is the key to yellowtail snapper fishing in Miami. Chum gets the snapper frenzied enough to sit right off the stern of the boat (even in 100+ ft depths). Current is necessary for this fishery so the chum successfully flows away from the boat and disperses across the reef. Small hooks (we prefer #2 or #4 Matzuo J-hooks) and light leader (20lb test) should be deployed to ensure action. The largest snapper shy away from poorly presented baits. Yellowtail can be caught during the day as well, though they are much more aggressive at night. Small pilchards, chunks of bonito, or silversides are the best baits but just about anything will work if they are chummed up. If there is a strong current, jig heads or split shots can be employed to get baits down to the strike zone. The best snapper fishing is enjoyed during summer. Yellowtail Snapper range from 12" to 5lbs, with average fish ranging from 1-3lb range. Yellowtailing is not a catch and release fishery, as they have delicious white fillets that never go to waste. 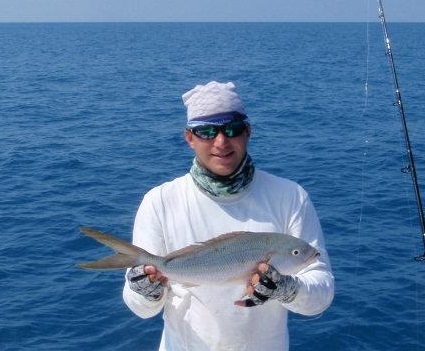 Snapper fishing is a lot of fun, especially for those looking for light tackle fishing charters in Miami.